Join the creator of Lesley Riley’s TAP Transfer Artist Paper and a cadre of talented designers, including several frequent contributors to Cloth Paper Scissors magazine, to explore exciting new ideas to create with TAP. With a sheet of TAP and a hot iron, you can transfer a permanent image onto almost any solid surface. Try 16 fun, new projects ranging from jewelry to home accessories and mixed-media arts. Learn to transfer images onto new surfaces such as faux bone, as well as fabric, paper, wood, metal, and glass; use with encaustic. Use the many techniques as a jumping-off point for creating your own TAP magic. My featured project consists of jewelry made of Faux Bone with TAP transfers of my paintings and mixed media artwork. Faux bone is a smooth non-toxic plastic similar to PVC. It can be cut, sanded, carved and drilled to form any shape. 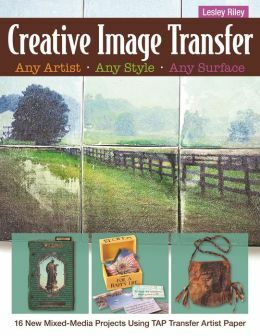 It accepts the TAP transfers nicely to make jewelry that showcases miniature versions of your artwork. I am anxiously awaiting my Barnes & Noble moment when I get to go into the store and see it in print! It is always such a thrill to stand in front of the shelves and know that when you open the pages, your artwork will be in there! Magic! Thanks, Lesley, for the opportunity! This entry was posted in Uncategorized and tagged Faux Bone, jewelry, Lesley Riley, TAP, transfer by Sandy Lupton. Bookmark the permalink.